Size: 2ft or 3ft long and 15.5 inches wide. These low frequency bass trap type sound absorbing foam corner traps reduce corner reverberation & absorb low frequency sounds and increase the quality of music and final mix. A much cheaper alternative to the normal bass traps used. When recording or mixing music you want to listen to the music and not the room!! Low-end frequencies have very long wavelengths and tend to build up in corners. These bass note wavelengths have a lot of strength. This means that more sound absorbing foam is necessary to absorb these frequencies. This is why our low frequency corner traps are absolutely essential in any room that is going to be used for recording, mixing or practising. Add to that the fact that low end frequencies usually build up in the corners of a room and this is why corner traps or the more expensive bass traps are installed. A lot of people do not have the space or funds available to be able to treat a studio or music practice room with thick, bass trapping foam and isn’t normally required. Noise can be 6-12dB louder in a corner than any other part of a room and this is why we insist on the installation of the corner traps. These corner traps will effectively soak up the low-end frequencies within the room. What they also do is help to better define the low frequencies bringing them under control and easier on the ear. This in turn helps you to achieve better results in your recordings. If a person is having trouble with the music sounding good in the studio but terrible in another room then acoustic corner traps are essential. The situation just mentioned is a common problem and can easily be solved with the use of these corner traps. They are not expensive and it’s not necessary to fill a room with them. With correct installation in the right places low-end frequencies are tightened and excessive colouration is removed. 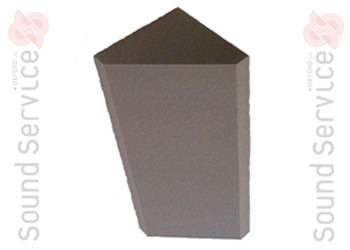 For best results theseAcoustic Corner Traps should be installed25 – 45mm away from corners and at varying heights. It may be necessary to move them around until optimum positioning has been found.